I am using the Zonal Stats plugin in QGIS to extract raster statistics from overlaying polygons (I have shapefiles of species distribution and I want to extract environmental data from within each species' range). I have 300 or so files I need to get data from and so would like to write a script to run in the python console, however I am a complete novice with python and have no idea how to do this. calculates by default just Count, Sum and Mean (as you can tell from Raster -> Zonal Statistics in QGIS Desktop, it can do a lot more). see API for all options. You might modify this to accomodate multiple files with some loop..
Great. Thank you very much vinayan, that's exactly what I was after. This still works great from the qgis --code command line. I was not able to get it working from raw python however. Here is way to get what you want in SAGA GIS. This probably isn't the solution you want, but it works. I'll look into the reasons why my plugins fails and update it as soon as possible. Install SAGA GIS (should also be available via apt-get or aptitudbe in your linux distribution). Start SAGA, load in your Raster and vector shape (Menu Modules -> File -> GDAL/OGR import). You can see the process below. This works for the dataset you sent me. It is also possible to call SAGA modules in QGIS via SEXTANTE as a BATCH process. To do this simply activate the SAGA modules in the SEXTANTE options. thanks for the suggestion but I've already tried saga - the results it produced were inconsistent i.e. doing the same thing twice gave different results. 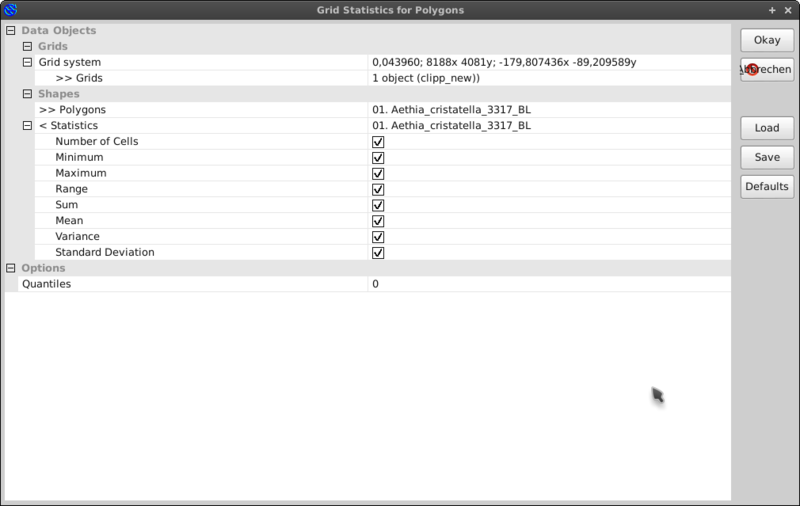 I know the ZonalStats plugin in QGIS works, hence I'm after a way to automate ZonalStats. @vinayan i have the code which u have given for zonal statastics but it is creating the columns in the polygon vector layer but not updating the calculated values. Why is it so? [SOLVED] Can one expose variables to the Python console from a plugin in QGIS?